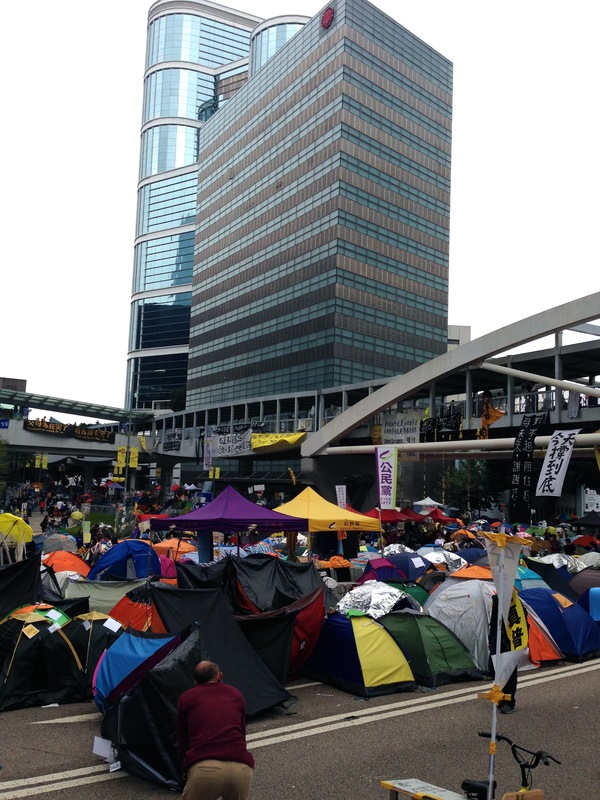 Last week, I visited the site of the two-month Hong Kong occupation known as the Umbrella Revolution. 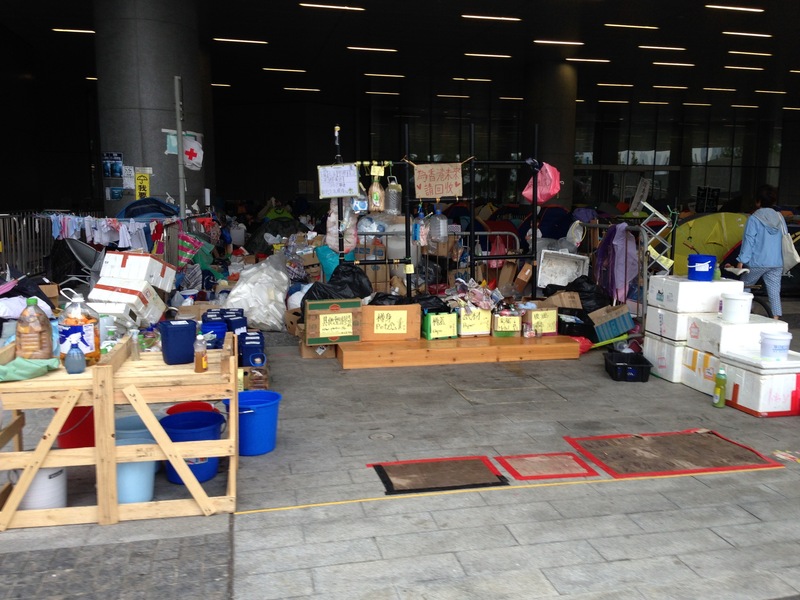 In recent days, in violent clashes with the students, police have begun to dismantle a secondary site at Mong Kok. 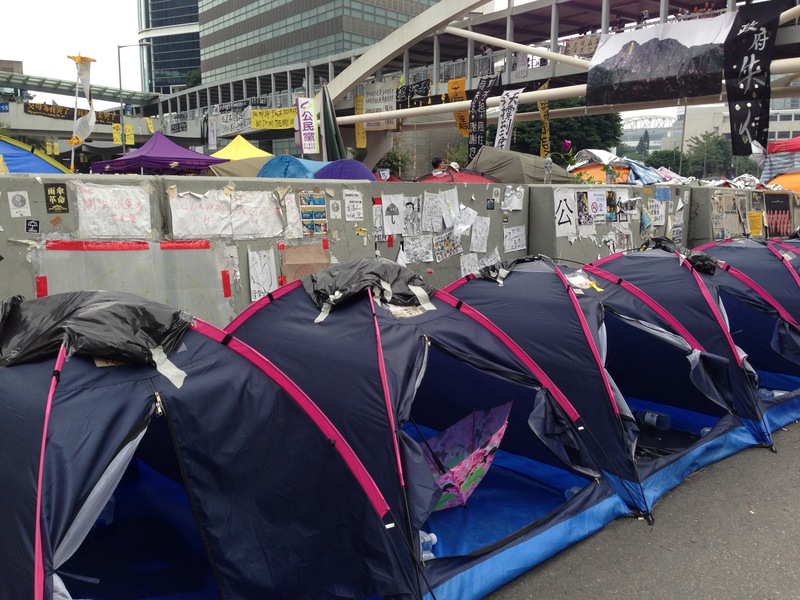 Yet this encampment, which has blocked traffic in the main city square for nine weeks , still stands. 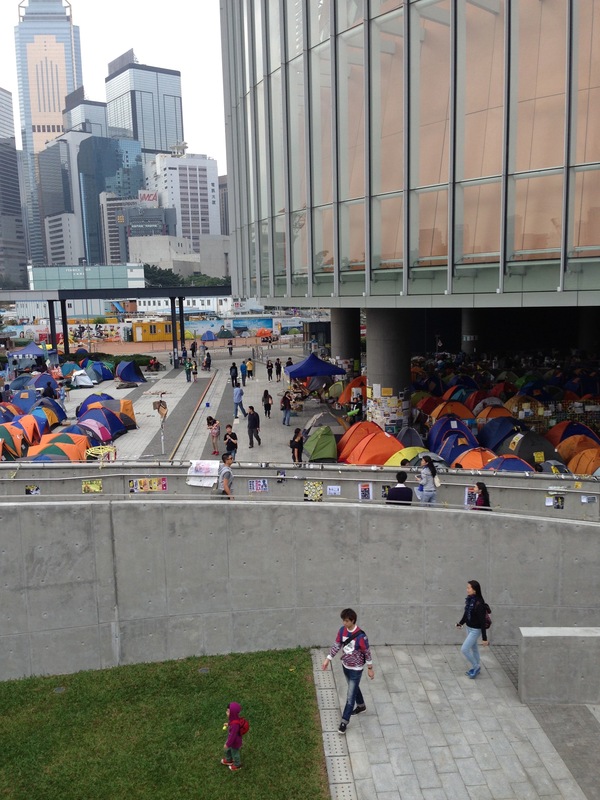 Of the many people I met with in Hong Kong, the younger ones were passionately in favor of the protestors’ actions, while their elders agreed with the cry for universal suffrage, but disagreed with violence and disruption. As an American, I found the students’ demand to be able to vote for candidates of their choice, rather than Beijing-selected candidates, a basic human right. 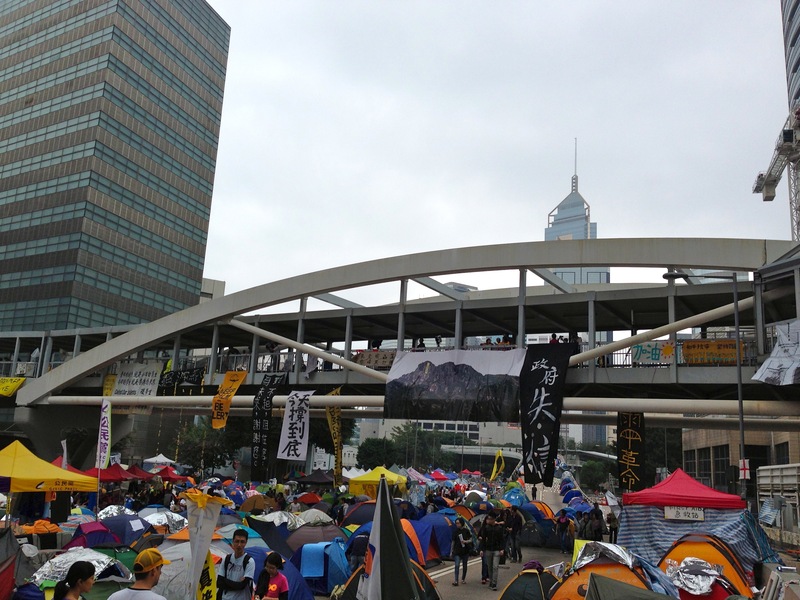 The scope of the protest was larger than I’d imagined and larger than the media reported—thousands of tents occupied key Central Business District areas, and thousands of visitors and well-wishers came to the site. Big crowds came on Sunday to have a look and lend support. 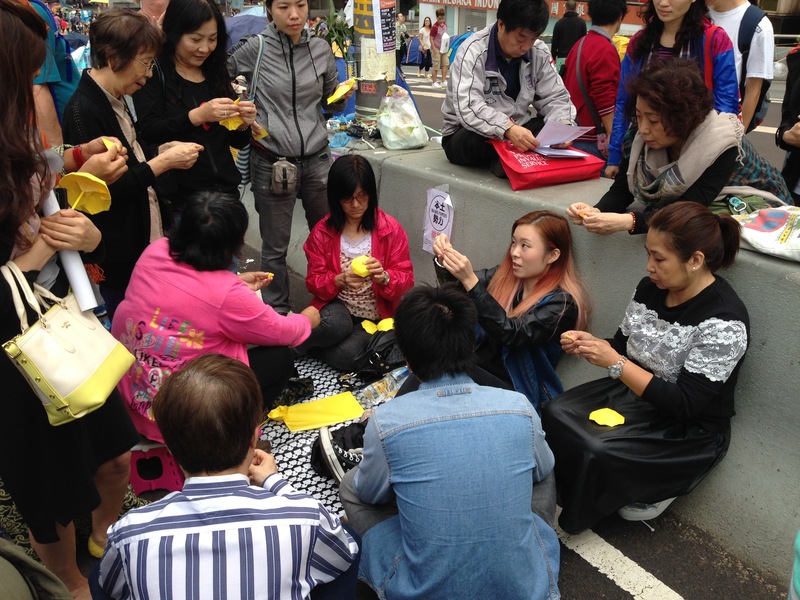 The atmosphere was calm, friendly, and fraternal—surprisingly, not a police officer in sight. 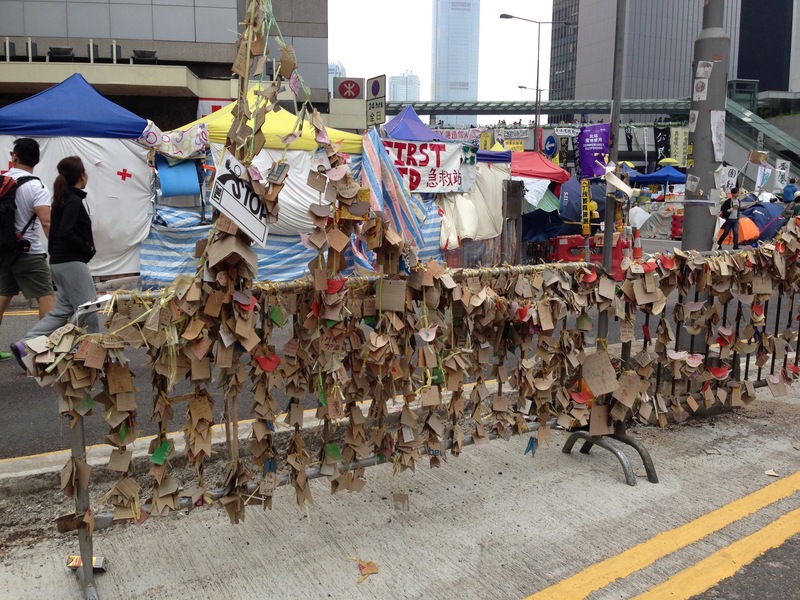 Handwritten wishes for freedom were tied to the barricades. 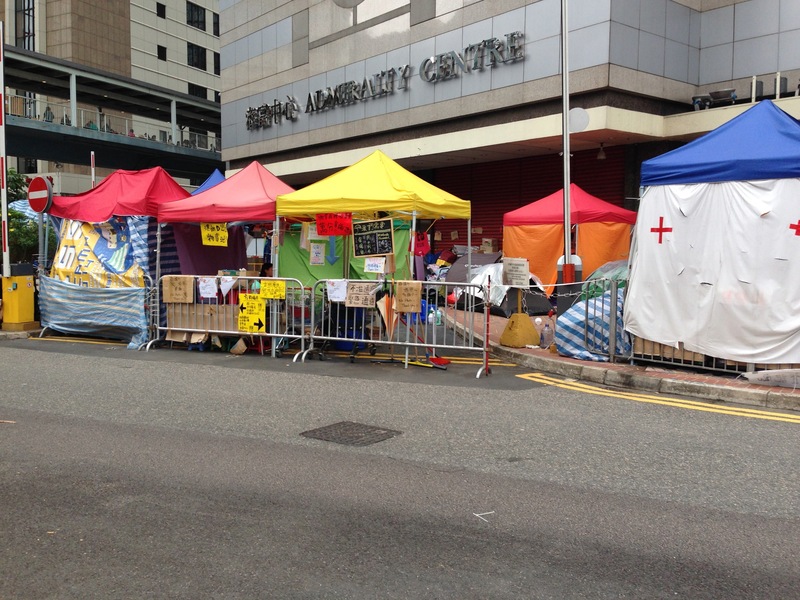 Kiosks were set up to provide different services, including first aid, massage, and even mental health services for those who needed extra support. Order and cleanliness were the rule of the day. Not a scrap of litter in sight! 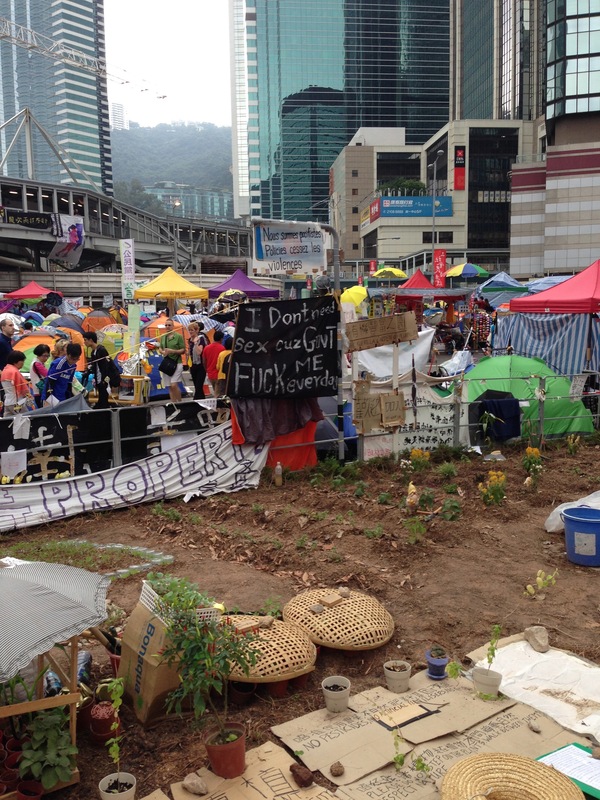 In contrast to Occupy Wall Street, nobody was high, either. 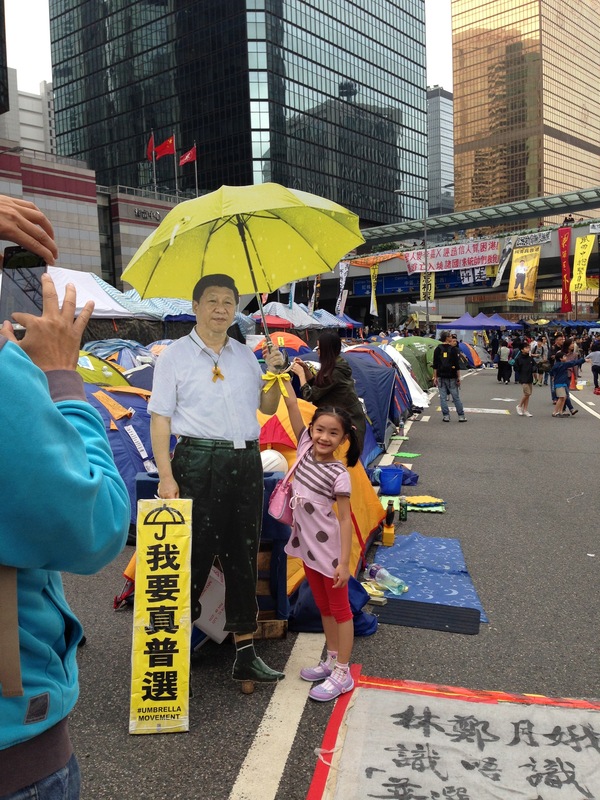 A cutout of Chinese President Xi Jinping “supporting” the Umbrella Revolution. Not! Still, everyone wanted to be photographed with him. Thought I’d have coffee with him myself. Rubbish is recycled to make an herb and vegetable garden. 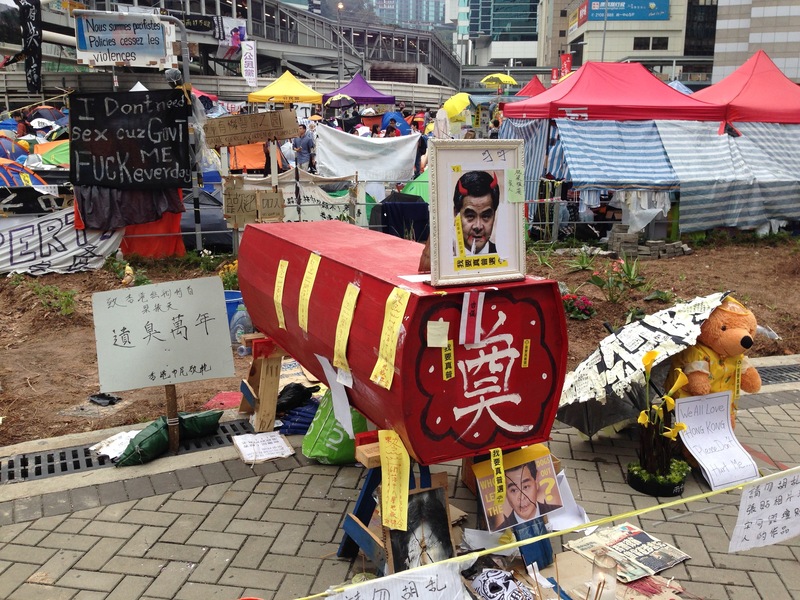 Chinese president’s “coffin” with an explicit sign in the background. 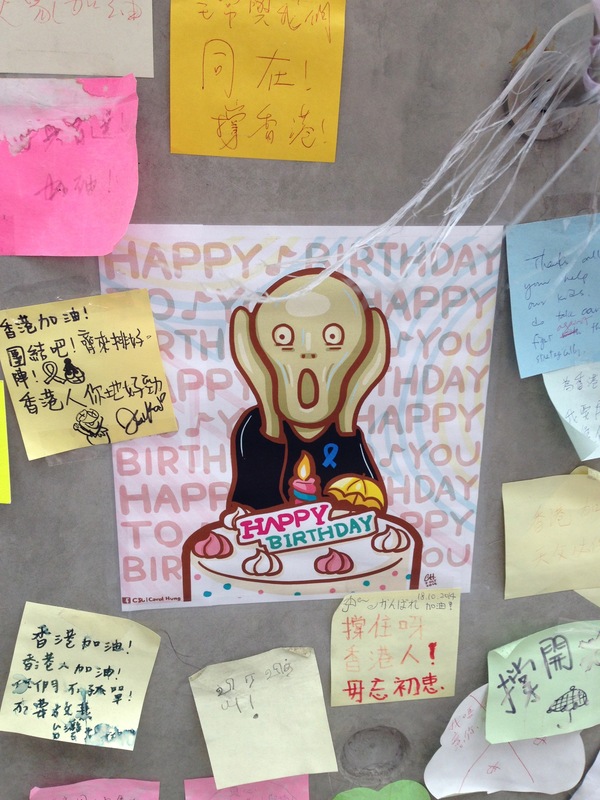 Whenever police beat up a protestor, the others gathered around and sang Happy Birthday, which they found dissipated the violence. 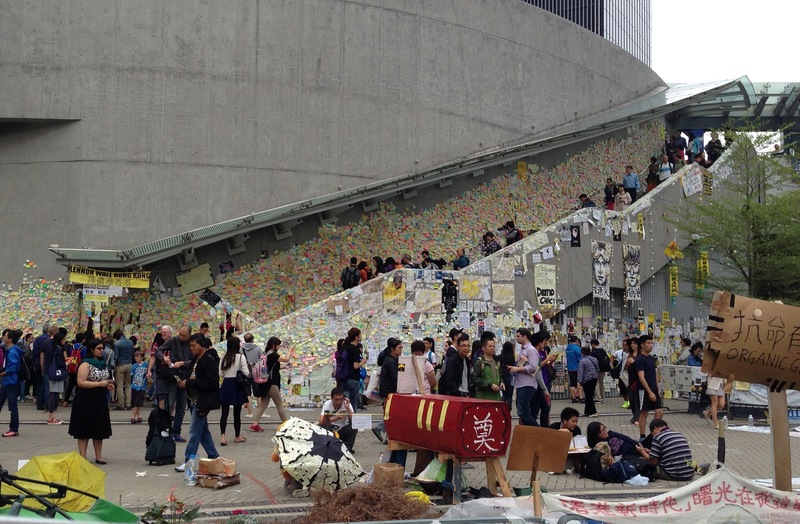 The “Lennon Wall,” inspired by John, where thousands came to place post-it wishes for democracy and freedom. Wishes for peace were everywhere present. 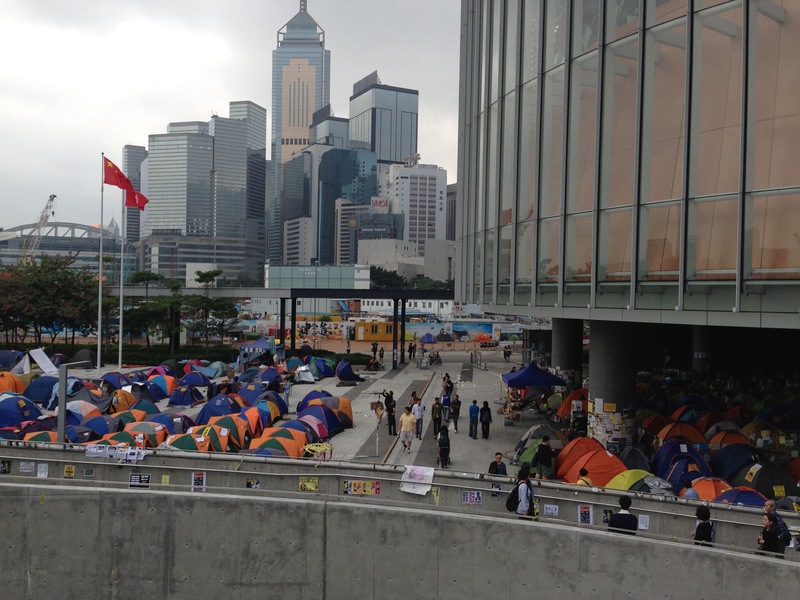 Juxtaposed agaist Hong Kong’s soaring skyskrapers, the humble tents and handwritten messages were a dramatic sight. 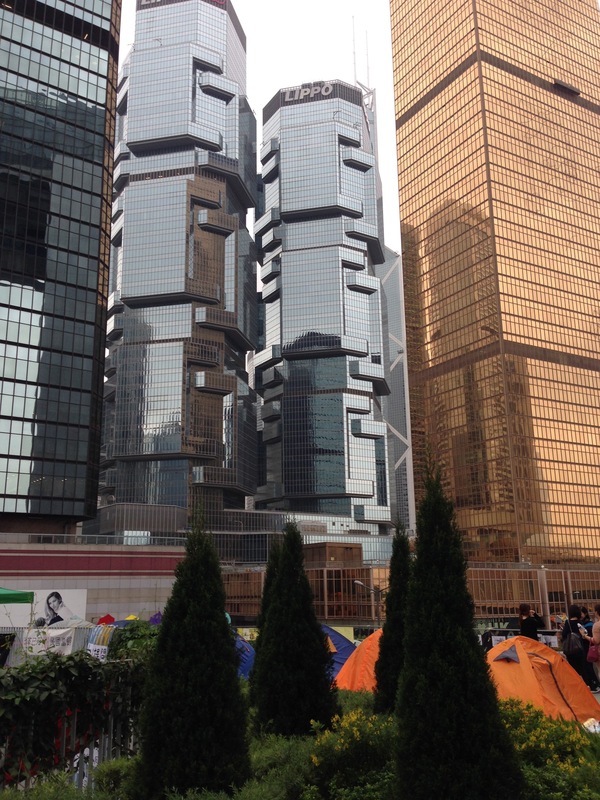 Skyscrapers filled with business disrupted by the occupiers towered above the protest. 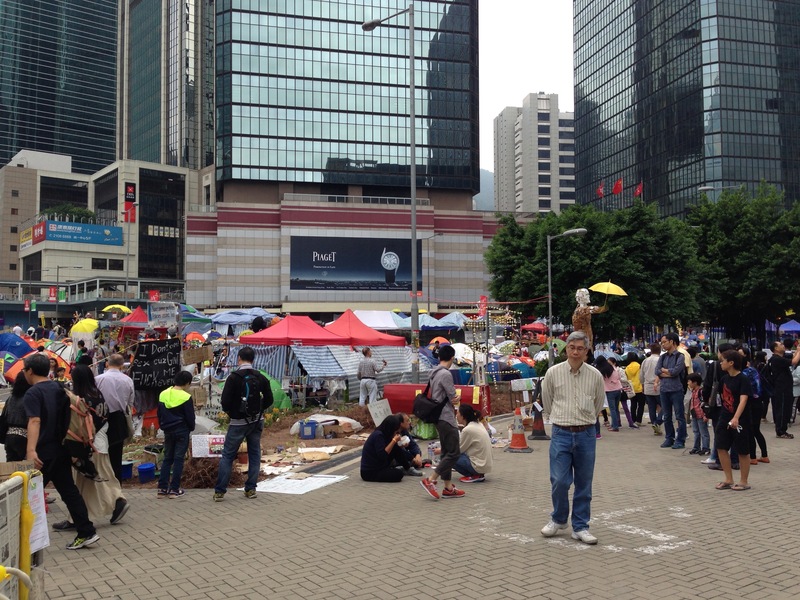 The occupiers have halted traffic in the business district for two months. Another vista. 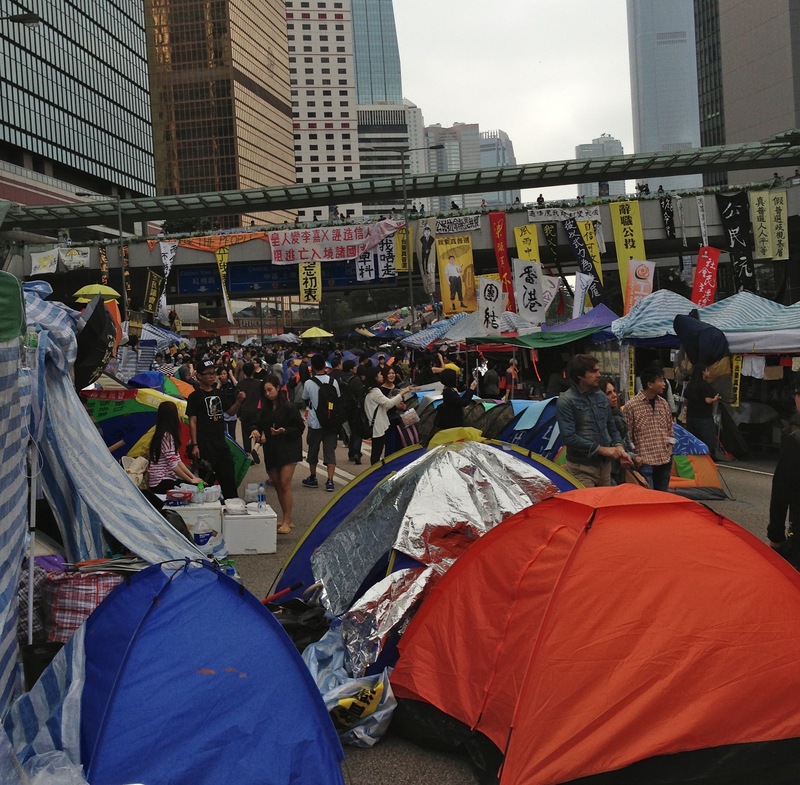 The protests spread throughout the city center. Library and study center. 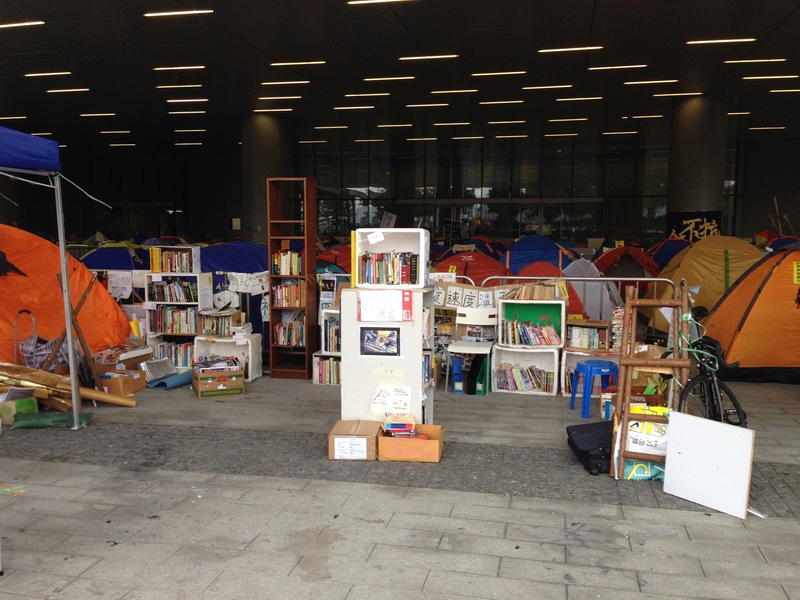 After all, the occupiers are largely students. Massive recycling center for waste. 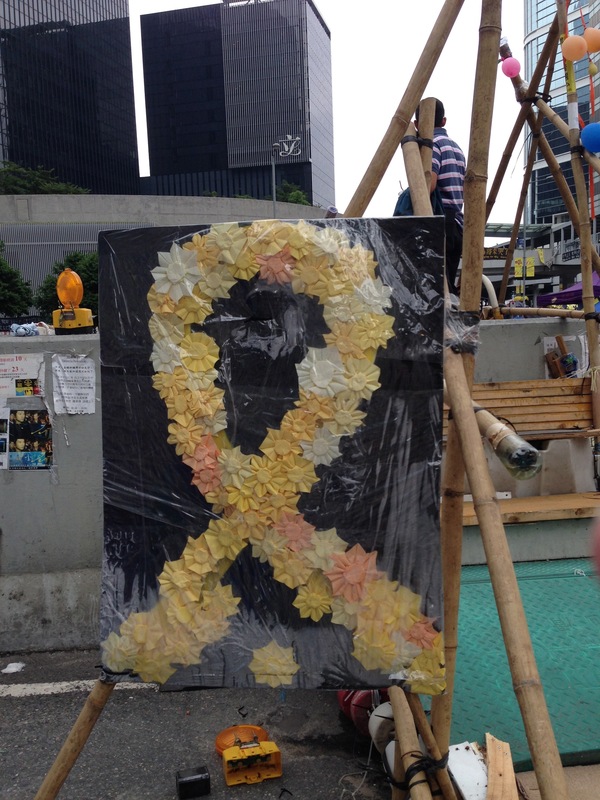 Piaget, the Official Sponsor of the Umbrella Movement? 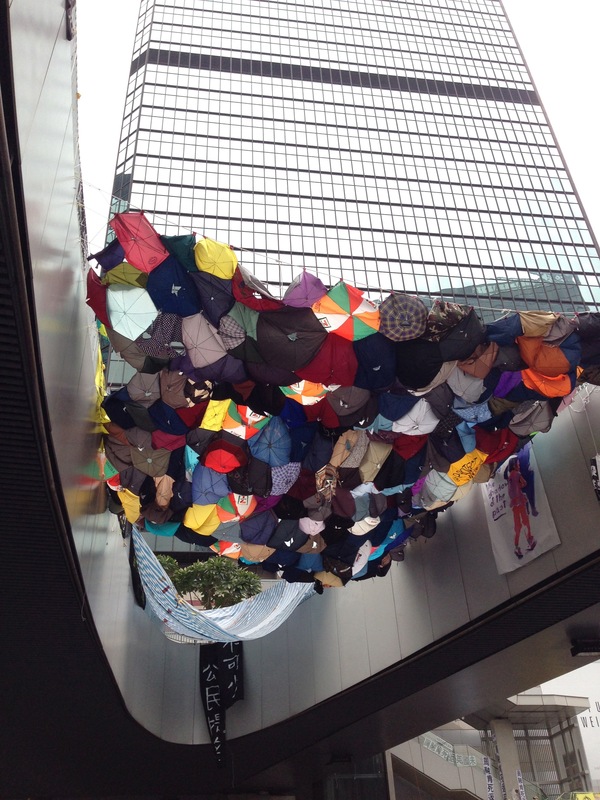 Broken umbrellas from police encounters hung above the site as a reminder of sacrifices made. Origami lessons! Wish we had time to learn! 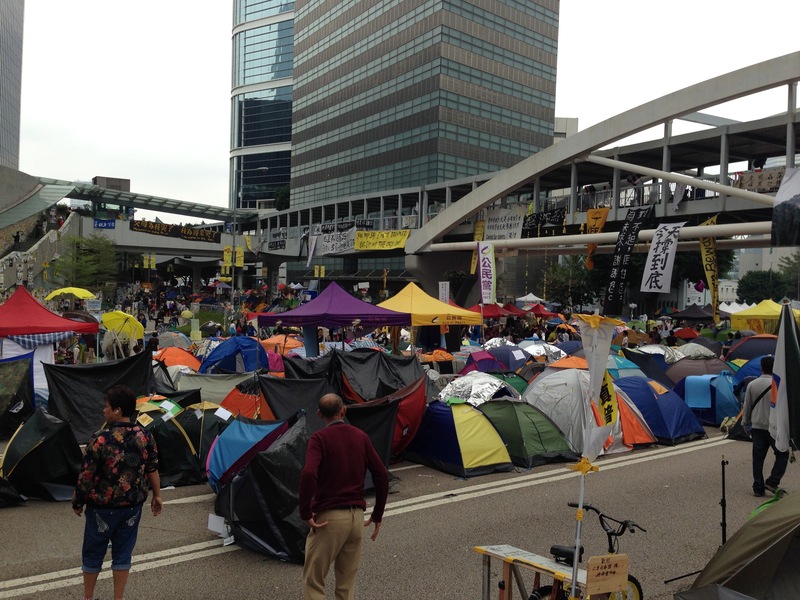 I think Hong Kong will miss the protestors when they are gone. 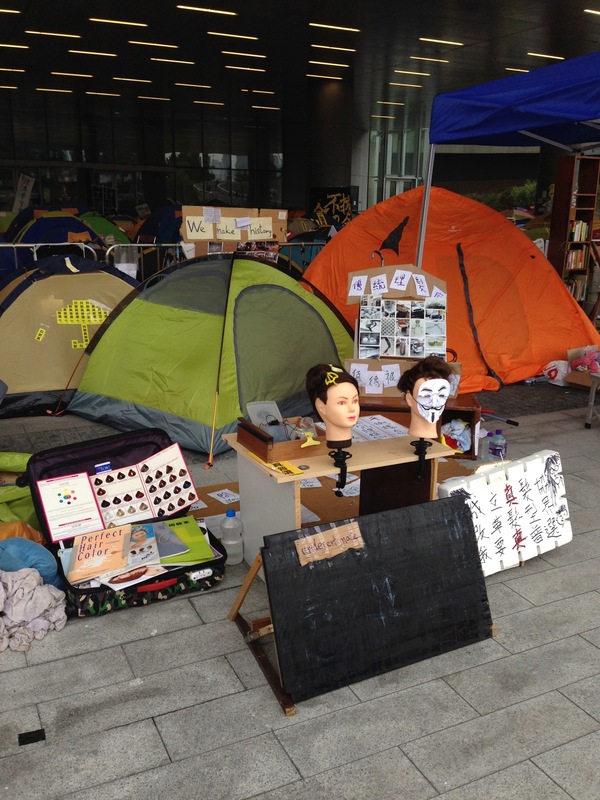 Not only did the site become a tourist attraction of sorts but the students’ demands reflected the wishes, spoken or unspoken, of the many. When will oppressors get the message that human beings crave freedom? Let’s pray for the brave young people willing to defy authority and risk their lives to win democracy.